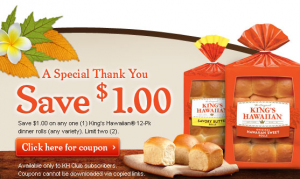 King’s Hawaiian Rolls has a new high value printable coupon out now. Print this one twice as it wont last long! There is also $1 off 1-24pk or 2 King’s Hawaiian Products, exp. 1/15/12 (RP 11/13/11). With all the Holiday traveling and preparing for a large Thanksgiving meal I thought it would be a good time to share a simple and easy dinner recipe or even great to serve to the guest that you may be entertaining this weekend. This sounds good! We LOVE Kings Hawaiian rolls. We’ll be sure to try this easy dish. Says I’ve already printed, never have. Also someone else’s email is in the url. Tried changing it to my email, didn’t help. Same here, couldnt print says i’ve already printed? ?